Gazepoint was recently featured as a case study on the Point Grey Research Insight newsletter. Point Grey Research is a leading machine vision camera manufacturer, and the source of the high quality machine vision cameras we use in the GP3. We met Point Grey at the SIGGRAPH conference in Anaheim this year and they invited us to provide them with a case study for their newsletter and we’re happy to see the study come out in the November edition. The Gazepoint GP3 may be the least expensive eye-tracker on the market but that doesn’t mean it’s the ‘cheapest quality’. As you can see, we actually use a high quality machine vision camera (not a webcam) with excellent infrared sensitivity, high frame rate, and many more machine vision features. We chose the highest quality camera available as the camera quality directly impacts the quality of the eye tracking. We often get the question, “How can your system be so affordable? What corners did you cut?”. The answer is, we didn’t cut any corners when it comes to quality: we designed the most cutting edge technology and optimized the manufacturing and business processes to produce a high quality eye-tracker without a lot of overhead. When I founded Mirametrix in 2008 I was new to product manufacturing and production costs were high so we sold our eye trackers for several thousand dollars. Now with the advent of 3D printing and other rapid prototyping processes, manufacturing has become much faster and cheaper, allowing us to produce a research-grade eye tracker for under $500. 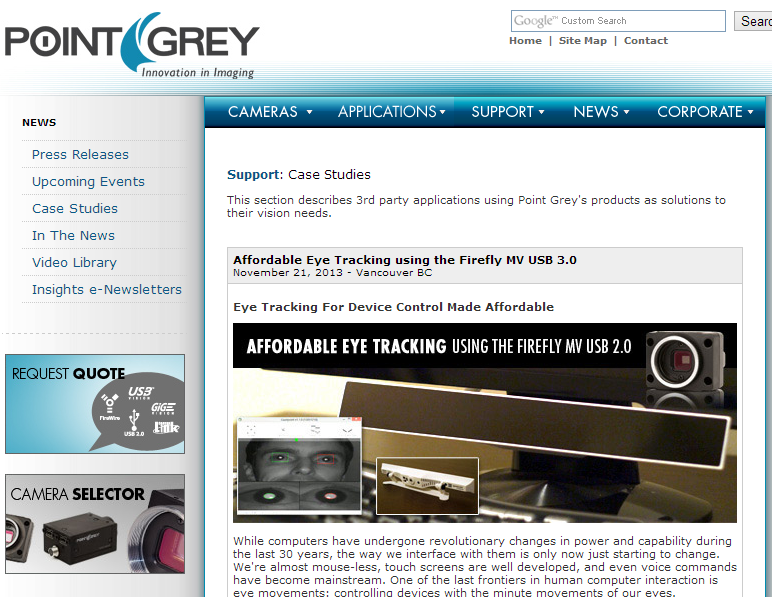 If you’re spending $10,000, $20,000 or more for your eye tracking hardware, what you are getting for all that expense?? Gazepoint is truly leading the way to expand the use of eye tracking in every day applications.